Hi, I wanted to share with you how I blinged up this velvet skirt. ( I got this $100.00 skirt for $12.00. I love those end of the season racks at the expensive department stores ;-). It is a beautiful velvet skirt but kind of boring. 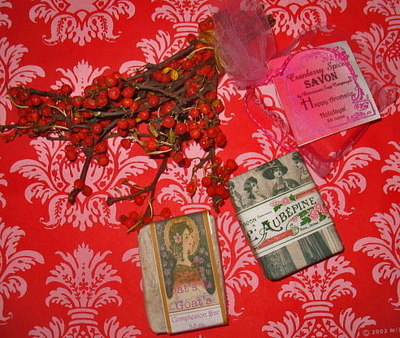 Plus velvet is so formal and I wanted to be able to use it for every day. I brain-stormed for a while how to "Anthroplogie" it and I am happy how it came out. Here is what I did. I got some cheap polyester lining for suits and such at the fabric store, about 1/2 yard. I tore it into 1/2" wide long strips. The fabric did not always tear straight but that was okay! If a strip was too wide, I would tear it in half again, lengthwise. To get the tearing going, I would first have to make a snip in the fabric with scissors. When I had a ton of strips, I put on a good movie and with a needle/tread hand-gathered the strips. Again not being perfect, I would run the needle in and out of the fabric and every few inches, knot off the thread (but I did not cut the thread but kept sewing it until I got to the end of the strip). After a month of this I took all these gathered strips and arranged them on the skirt, overlapping and basically playing with them until I found a pattern I liked. Then I pinned the strips to the velvet and just sewed down the center. I left the edges raw. Really it is simple to do, just a bit time consuming but a great reason to watch a movie. This skirt looks great dressed up but also great with a chunky sweater and boots!! PS do you like my teal shoes? A 50th birthday gift and another end-of-the-season deal! I made a new spring apron and had to share! A couple of months ago, I was able to hit the bins at Goodwill. They have certain stores where you just pay by the pound. These carts roll out and you dig through them and like I said, pay by the pound. I had soooooo much fun and totally scorned a bunch of vintage (30's and 40's) clothes. I got handmade matching little girls dresses (big sis and little sis) with mini rick-rack trim from the 30's. They are in perfect condition and are of museum quality. Really, I think I am going to sell them. Anyways if you get a chance to go to the bins, go for it!! Well onto the apron. 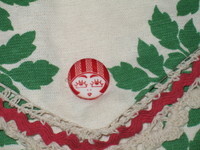 This apron starts with a little girl's dress (not vintage) that I got at the bins. I loved the fabric and actually only bought it for the ruffle.The dress is a straight piece with elastic at the top and ribbons tying at the shoulder. So I started by taking out the side seam and the elastic. Then I had a big flat piece and decided to do more with it. 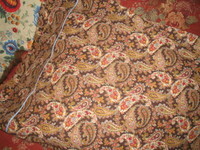 I also bought a round embroidered cloth, not in the best of shape, so I cut that in half. For the waist, I simple pulled out some vintage red seam binding and a little hot pink hem-facing lace to go over the seam binding in the front for interest. I sewed the half circle to the top of the dress and then the seam binding and then the lace. Waa-laaa, I have an adorable apron!! Well only I am crazy enough to buy a white (well cream) couch! Actually a white couch with a slipcover is brilliant, because you can bleach the slipcover. BUT my couch does not have a slipcover. So I always keep a pretty twin quilt draped over it. Of course though the minute you sit on it, it slides all over the place, ugg. I was looking through a catalogue and saw these furniture covers for your for pets. What I love about them is they covered the high traffic areas but you can still see the lines of the couch. However they are expensive and havebad reviews. So I came up with my own and it is sooo easy. 1. I took a twin quilt and ran it length wise down the couch. This way you have a long piece hanging down the back, this keeps the cover from moving to much. 2. I measured across the seat, adding an inch on each side and cut up the quilt. So you will have one long piece for the couch and one long skinny piece leftover. 3. For the arms I measured how wide the arm is and the length from the seat, over the arm with some extra hanging over (to help keep the piece in place better). 4. I cut those two pieces from the leftover piece. 5. I figured out where the long piece and the arm pieces would attach and sew it together. You should probably finish off the raw edges with seam binding but I am lazy and did not ;-p If it starts to really fray I will add the binding then. I do not see why this would not work with a bigger couch/quilt. I will say it does not slip as much as just the quilt. 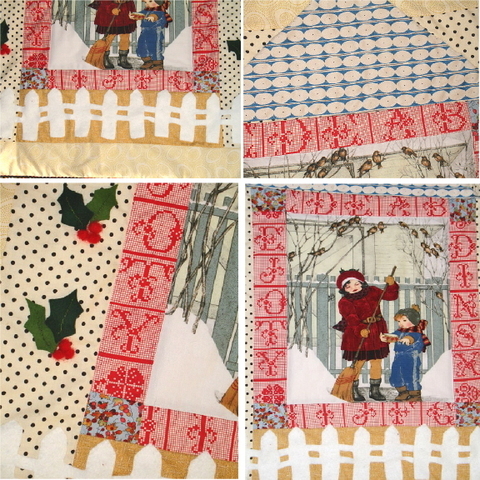 I am thrilled a plan on making several to go with different seasons and feels!!! 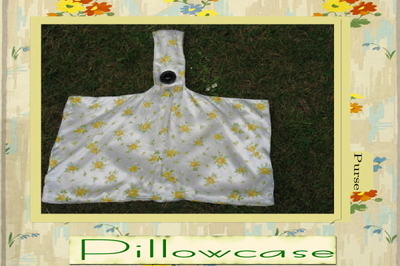 I do not know if you remember my old mixer cover made from a pillow case? I love it but it does not go with my pantry now. I wanted something old-world feeling. Two years ago I embroidered this charming doll and have been looks for the right fabric since. I finally found it. It is black with bits of red and gold like I wanted. It feels very Russian to me. My father's mother Claire (who I am named after) was born in Russia. My Grandfather Isador was born in Poland and went to Germany at age 10 to apprentice as a baker. He met my Grandmother there and they married, moved to England and eventually came to San Francisco, where I was born. I have never met my grandparents. My Grandmother Claire had a stroke and died when my father was 16 and my Grandfather died 6 months later of a broken heart. But I have felt a very strong connection to this side of my family since I was a young child. I decided at about age 10, whoever I married should take my name with their as a remembrance to all my family who died in the Holocaust (only 2 people made it out of Germany). This is why my husband also goes by Fox-Hughes. He generously took my families name Fox as his own, love that man. I only have two pictures of my Grandmother Claire, a set of silver candlesticks (my most prized possession) and a beautiful, huge, carved round mirror. There is almost no family left, only a handful of story to hold onto. I always thought I could have been born only two generation earlier and been lost in the Holocaust. It struck me as a child how blessed I was. As I said I have a very strong connection to my Grandmother. I like to imagine cook with her and my grandfather teaching me how to make rye bread. So it seemed fitting to using something Russian feeling in my baking pantry. I embroidered пирог because means cake in Russian. In the picture you see a pin but I will put a snap there. The cover is a long straight piece and I just folded in the sides. I wanted a burlap runner with a gathered edge, which is not that hard to make. But I am always thinking of those who hate sewing, like I use to (and still do some days) and wanted to create a simpler version. I have to say this was sooooooo easy (did I get enough o's in there). Really and I think it turned out charming!!!! It has been a long week. David was doing better, then all the sudden started to do worse. I think it is just wearing on him. And on me, I have to do a lot for him and getting up in the middle of the night and early morning to help him, lots of appointments (which I hate). But you know even in the midst of it all, I have need to create something. Maybe even more then normal. I even got my little front room silhouette Christmas tree done (I will share soon). I decided this pretty beret needed a little something. I wanted to make a wool flower fast and easy. I hope you do to. 1, Cut two circles of fabric. I decided what size I wanted my pin to be and then made a circle a little smaller. I used wool and left the edges raw. 2. Take a circle and fold in in half, but with one side sticking out a little farther then the other and pin. 3. 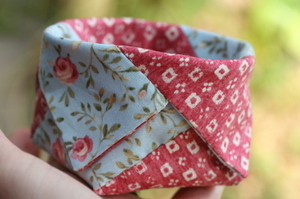 With a needle and thread, run a basting stitch through the fold and pull and gather. Keep running the needle through and pulling till you get the gather you like. Knot off thread. 4, You want the shorter front half of the circle gathered and the larger back half flat. 5, Gather the other circle and knot off. 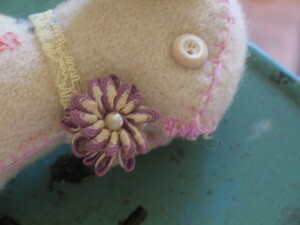 6, Now sew the two gathered edges together and sew a button onto the center of the flower. 7, Sew a pin-back on and be done !!!!! Thank you everyone for the wonderful Tasha Tudor day. There were so many celebrating this year, it was marvelous to see how each person had their own way of admiring Tasha. There were some really touching posts. The one thread running through all the posts, was the admiration of how Tasha lived the life she wanted. Thank you again everyone. This is a bag I actually made last spring and am finally getting around to posting. 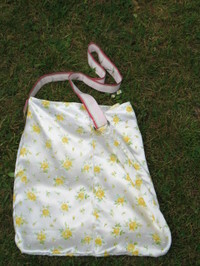 It is the wonderful Buttercup bag you see everywhere and is very easy to make, truly. I made the bag as a wristlet. I wanted some fun, bright, not-to-matchy strawberries. I just took a small length of chain, wrapped it around the handle and added some strawberries to it. I am hugely addicted to purses and like to change them everyday with my outfits. I am thinking now I need to make a fall buttercup !!! Well, I am back ;-) My in-laws have a cold, so the trip is postponed a week or so. Yeah, that gives me a week to clean (or till I have to clean) !!!!! Do you remember when I did a list not the long ago of things I love, someone had taken a pull-over and turned it into a cardigan? I had this pull-over with a deep v-front, I loved the color but it was not the most flattering sweater. I have had a rosey week. It has been sunny, pleasant (not hot) and although I still really have not done to much cleaning, it has been a lovely. 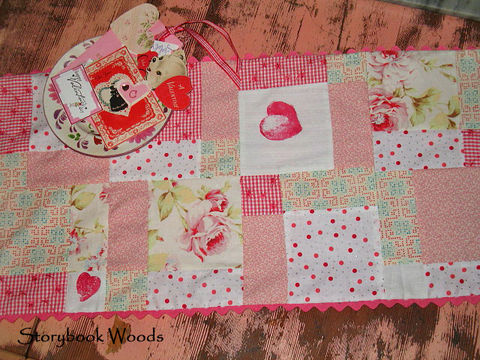 I saw this wonderful tutorial at LucyKate crafts, for making a strawberry jam cover. Well I have not made any strawberry jam this year but I have lots of rose syrup. So I a made a rose version. LucyKate also had a link to wonderful tutorial on making a felt rose. Mine turned out okay. I sewed my ribbon (variegated cotton yard) a bit to close ot the edge. Do not forget the giveaway !!!!! 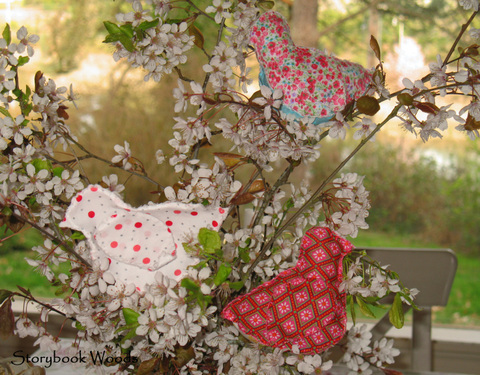 Chloe and I have been sewing little birds. She gave her grandmother one for Easter. 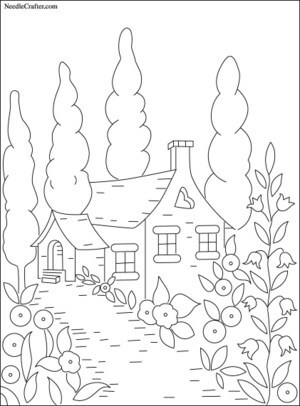 I use Martha's chicken pattern and left off the wattle and comb. I also shortened the beak. We just blanket stitched the edges. 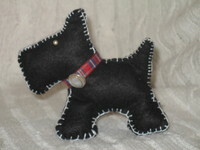 We prefer to hand sew and I like the look of it better. They were very easy to make. Also if you have not seen it, check Calamity Kim's birds. So sweet. Akk I can not believe I made a wall quilt. For those who do not know me, for years I said I would never quilt. When I was 19, I made a small quilt. I can not tell you how crooked, wobbly and a mess it was. Never again I said, ha !!!! At Christmas I saw this panel (below) and LOVED the center picture, it reminds of the old children books I adore. BUT I hated the rest of it (It all matched to much for me ;-). I keep thinking about it and what I could do, I finally decided to go for it. I decided to do the leaves and picket fence in wool felt (that I just appliqued on) Chloe needle-felted the holly berries for me, thank you Chloe. 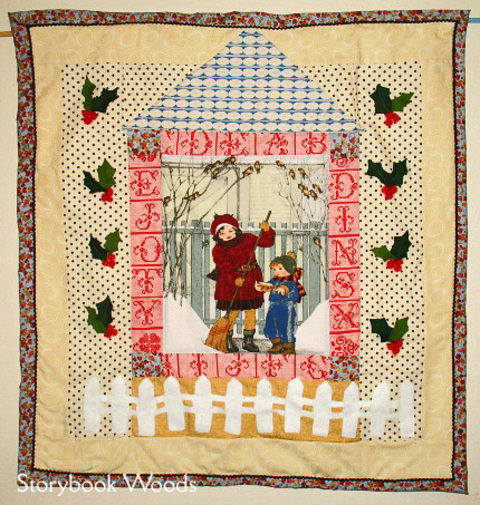 I actually quilted the scallops on the roof and appliqued it on but sadly you can not tell. 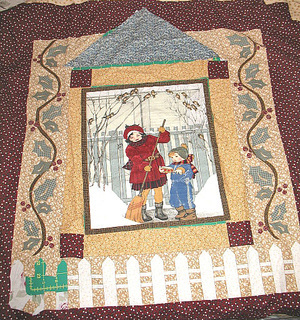 I think I needed to add more batting to the roof to make the quilting stand out. 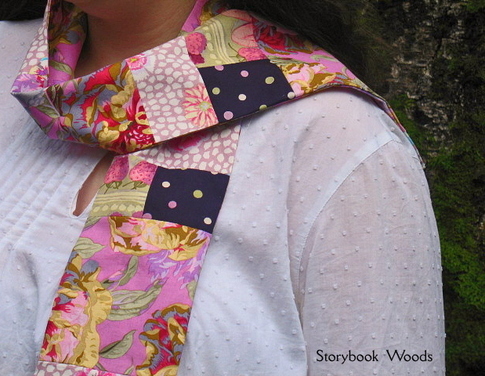 Yeah, I did a patchwork and did not kill anyone ;-) I made Kathy- Pink Chalk Studio, Rubblework scarf and love it. 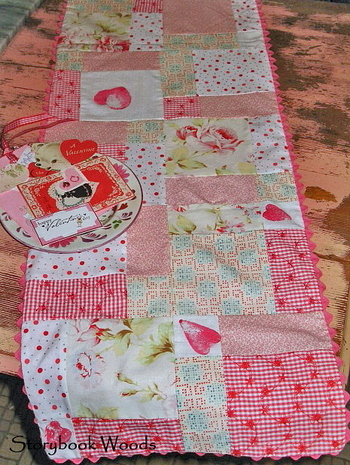 I soo struggle with patchwork, I can not cut anything straite (even with cutting mat, rotary cutter and guide. My scarf is skinnier then it is suppose to be and I spent 2 two hours re-cutting and still made mistakes. But I think you can not tell, I hope. Kathy if I see you at the grocery store, do not look too close at my scarf :-). But I have to say Kathy's scarf was very easy to make. As a dyslexic I have such trouble reading patterns but I was really impressed with how well written Kathy's pattern is. Very clear, easy to read, full of helpful information. I loved the extra tips she added but it was not so much information that it lost me. Sewing it was easy and it came together with no problem. One nice thing, is you are just purchasing a PDF file. No shipping to deal with. Wow everyone thank you for all the wonderful thrifty, creative (long list) of ideas. You have my brain going and that was just what I needed. 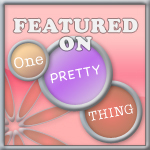 I will share what I did end up doing, but it will have to be after Christmas, since my girls read my blog :-} Here are some wonderful ideas to help get you going. I will be posting some fun and easy snowflake tags I have been making. Stay tuned. Oh my I want to do the boy in blue and the girl in pink !!!!! I love these mittens. We are talking about setting up a tea table this Christmas and having tea parties. I think at one of these we will make these mittens. Thank you Dawn. 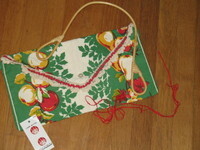 She also has a wonderful tutorial on making aged Christmas tags. I thought these were a brilliant idea Andrea and so easy. You know how blessings seem to come in groups, well I have had a couple of weeks of blessings. I am always amazed how giving the blogging world is. Whenever I think people do not care I always remember how generous everyone has been and realize that is not true. 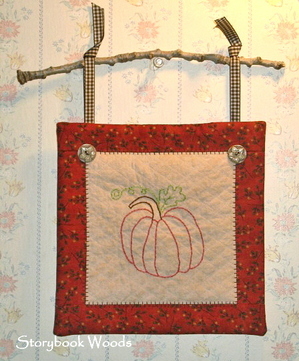 Linda sent me the most adorable mini autumn quilt. Isn't it wonderful. 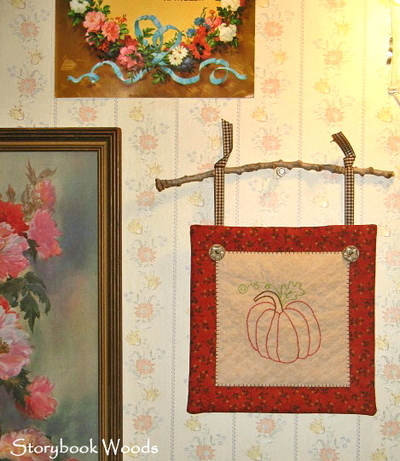 She tea dyed the fabric, embroidered the pumpkin, added ribbon and included a stick to hang it from. Linda for years owned a holiday shop and you cans see what a great eye she has. 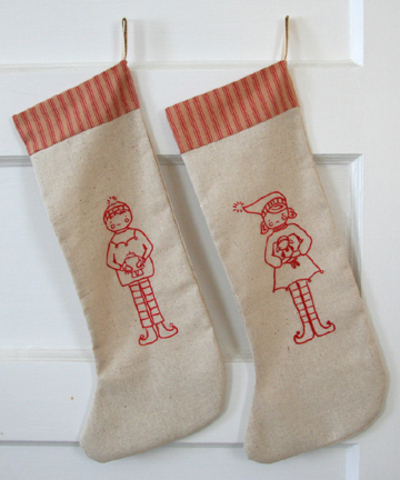 I thought this was such a clever idea, even if you do not sew. The quilt is about the size of a pot holder. 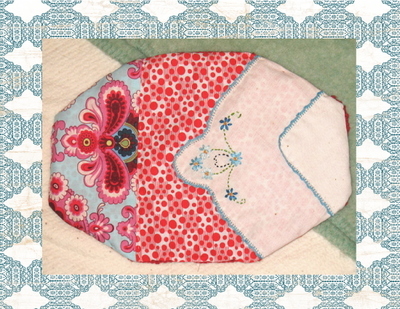 If you had some special hot pad or vintage pot holder you could do the same idea. Thank you Linda soo much. It is just beautiful and I see every time I cook. 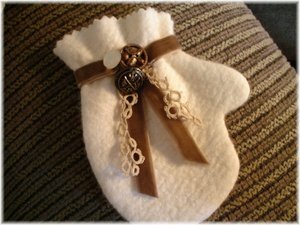 Also thank you for the inspiration, I am sure the ladies can come up with some very clever ideas from your hanging mini quilt. PS. your sewing is sooo perfect !!!! Janet(Janet is new to the blogging world, go say hello) was kind enough to offer some acorns to me. I do not have any that grow around here and was thrilled that she offered. 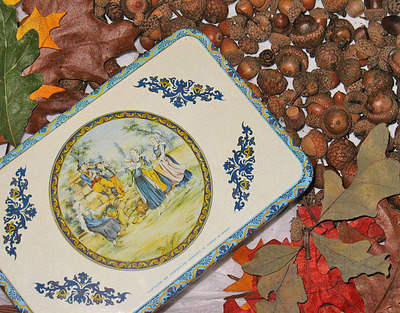 But I was not expecting them to come in such a beautiful old tin and also oak leaves. Thank you Janet for taking the time and being so kind. I have been sewing a lot lately. I made this apron for Chloe. It was so much fun because I just let it happen bit by bit. I took an old canvas money sack, opened it up and added tucks to the top. (yes there is a hole in the canvas at this point I have just left them there). I had to add fabric to the side and made the apron so it ties in the back. Sort of like a smock. I think she could just wear it out and about with her jeans if it were a bit shorter. I actually did a pieced square for pocket. This will probably be the closest I will ever get to quilting :-) I do not know how you quilt ladies do it. Chloe is thrilled with her apron. Now it is Aubern'es turn, well after I make four huge burlap drapes for my kitchen. 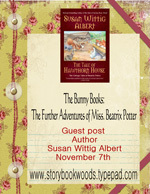 I do not know if you have seen it, but Susan Branch has new free patterns. I saw this scalloped apron and knew I had to make it. I have been unable to find an apron I love. I am large, curvy girl ;-) and I knew I needed an apron with curves. This turned out so prefect for me. If you read this Susan thank you for being so generous with all of us. But as I said I am big girl so I was a bit afraid her pattern would not fit me. I will try to explain as best as I can what I did to make the apron bigger. I added one inch to each of the three middle pieces, so that gives six inches extra. What I did was move the smallest side piece down as far as I could (click on pictures below). To determine how far I could move that piece down, I started at the other bottom and laid the four straps, reversing wide end to narrow end, so it took up less room. I place the small piece above that and then the other three pieces. I had room to add the inches then. I just took one of those fabrics pens that vanish when fabric is wetted and drew a line in inch out from the pattern. The pattern calls for 7 yards of seam binding but if you buy those packages, they are four yards. So two packages will give you the extra seam binding. The only thing is I really need a pocket. So another day I have to figure out how to add one. 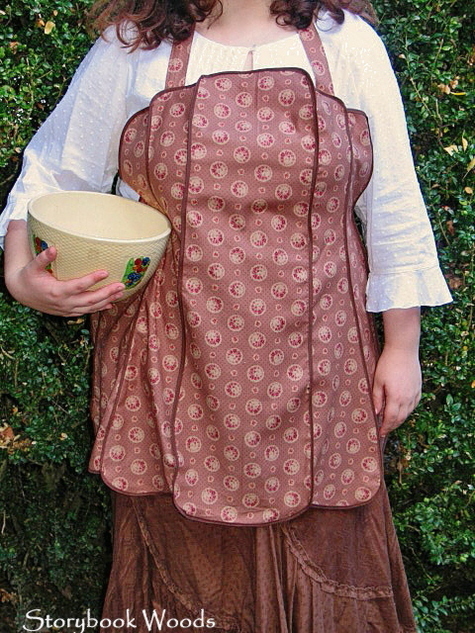 But I LOVE this apron and the fabric. Say hello to my little froggy friend du Puy. 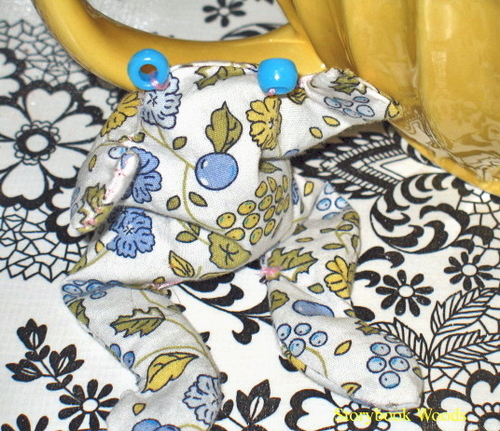 I named him du Puy because he is filled with little french lentils (and I name everything after food ;-) I saw this wonderful project over at Pearl Bee. Have fun making one yourself !!!! Aubern'e is into pirates lately. Although it has nothing to do with the movie, she has not even seen them. She just finds the history fascinating. She is redoing her room in a pirate/rock n' roll theme. Think of pirates and a disco ball. I love my free thinking daughters. We made pillows cases today. It as so EASY !!!!! Why have I not being making my own ? Just think off all the amazing fabrics out there. I can personal them. My mind is spinning with ideas. If you have not made any, check out the tutorials. PS. 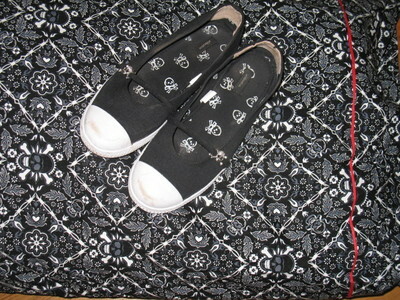 Look at Aubern'es cute pirate mary janes. Love Target !!!! Another purse out of an odd thing. I had this wonderful satin pillowcase. I loved it was looking for something special to use it for. I am highly addicted to purses and have a lot of them. I saw a bag I liked and thought I could copy it. I am happy with it, except I would say it is a bit wide. But I took the extra fabric and made another tote-bag out of that. I used a stripped ribbon belt, leftover from some pants that did not fit Chloe anymore. I just sewed it on, with belt loops and all. The width seem to work better with the tote. It was fun to play with. If you are looking for a really simple idea. 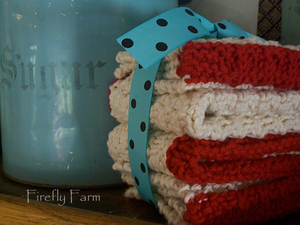 Here is a easy pillowcase bag (and were I first got the idea). If it does not come up. Look under April fashion section. What makes a handbag ?? I have been having fun thinking out of the bag on how to make handbag's out of things I would not normally use. I found (at the same store were I got the pillow) this $4.00 bag that is suppose to hold silverware. I loved it and thought it would make a fun handbag. Let me tell you, I am a lazy crafter. So everything I added, I did with Fabri-tac glue, no sewing. I LOVE this stuff use it all the time. Everyone should own a bottle !! I was planning on making a ribbon handle but when I was in Joanne's I saw this bamboo handle that looked perfect. I took some red seam binding. 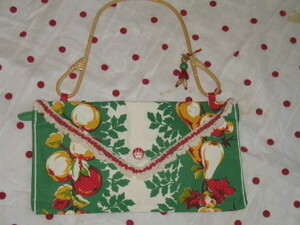 Cut loops, glued them to the back of the purse to hold the handle. Changed out button. 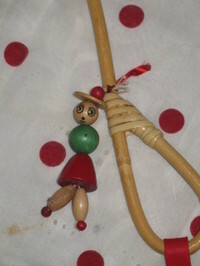 I went thru my stash of odds and ends and found this vintage wooden bead lady. (I am going to see if I can recreate her !! ). And wha-la !! a cute one of a kind purse to add to my (HUGE) collection. I need lots of purses though, well that is what I tell David. I change my purse everyday !! 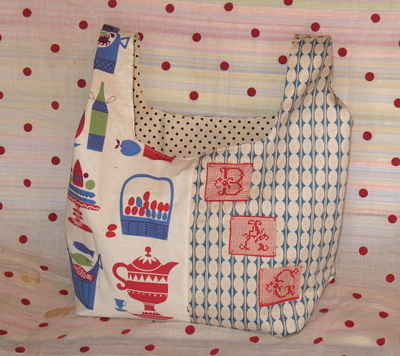 So what do you have laying around the house that you could glue ;- O (oh I am sorry "make") into a fabulous summer bag !!! PS. Still working on changing broadband carrier !! But I am trying to get back to normal. Well normal for me !! O’ TO have a little house! This is why I love a blog because when I find something really fun and have no one to share it with, it just is not as wonderful. 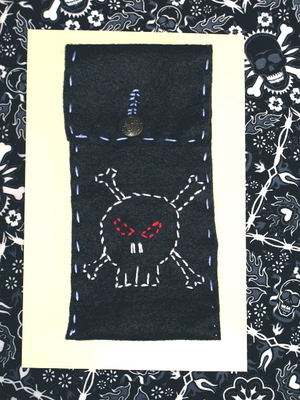 I love free embroidery patterns and Needle Crafter has some wonderful ones. I am especially in love with the cottages. 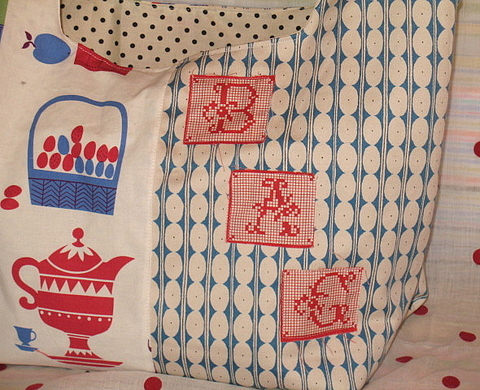 I have a new sewing machine and I am loving it. I never really enjoy sewing on a machine. I would rather hand sew. Which shocks me, I never knew that about myself. I am finding I do not get as frustrated though with my new machine. With summer here and being fat it is hard to find comfortable cool alternatives to shorts. 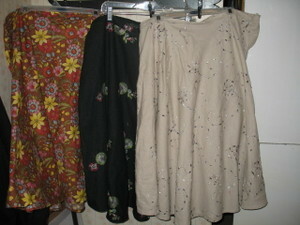 I am finding flowy cotton skirts are working well. I have a cotton bias cut skirt I got at Ross (for $8, yahooo) that I love and want to wear all the time. Well one day I was looking at it and realized all it was only 2 pieces and a waste band. So I got 2 1/4 yard fabric, laid the skirt down on it and cut out the shape of skirt. I set in a waist band. I did not want a zipper and I am sharing them with my DD. She is a size smaller then me, so I made the back half of the waist band a draw string waist. Easy, easy. So if you have a simple skirts you love I encourage you to use them as a pattern. Then you know what fits you and is comfortable. 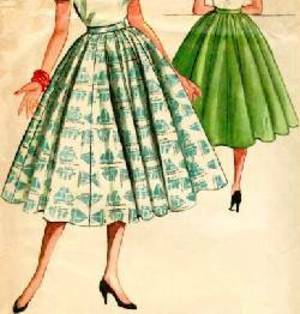 If you are not sure you can do this all on your own, here are some skirt tutorials. There are several how to makejeansinto a skirt tutorial but I thought this was a good one. Ohhh and my favorite (I have to make this skirt !!!) is the scalloped hem skirt.I love the way the scallop is only on the back. But you can do what you want !!! 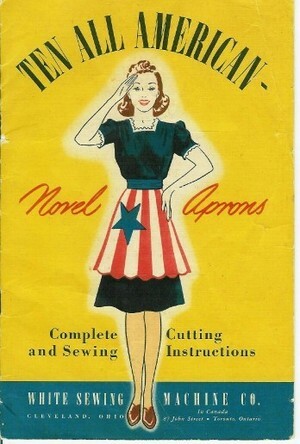 She also talks about how to make an un-waist. I LOVE aprons. I have several and want more. 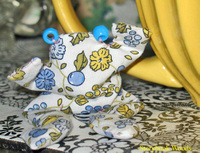 I would like to make a few and am always looking for pattern. Well thanks to Teresa, I found Ten All American Aprons!!! 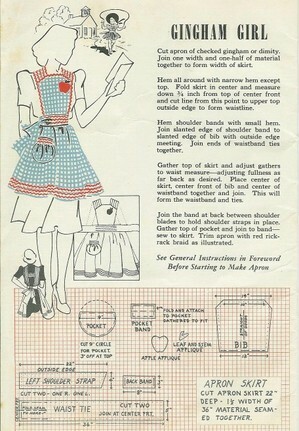 It is an old booklet with apron patterns to make. They are wonderful. Can you tell I am really excited. I love these cool vintage finds. Thank you Teresa, you are the best. Go the the link and that is the cover. Below is a link to each page. I love them all but I think the gingham girl is my fav. Enjoy and sew !!!! The girls have been having fun sewing. Aubern'e made aLambkin. Named Jake Lamb. 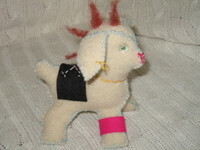 He has Mohawk (and did you see the earring in his ear) because he is in a band called the Bleats. 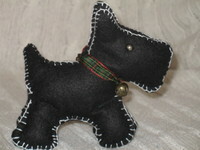 Chloe made a Scottie dog. Her name is Lady. She has a summer look !! And here is her winter look. There is also a Scotty flicker group. I have been so inspired by Vicki at- Turkeyfeathers. She has stared a flicker group Lambkin Stuffies. I decided I had to make one and it was so much fun. I took an old wool blanket and used that for the body. Did some embroidery. I did not have a pattern but just winged it. I added some lace and a flower around the neck. The flower is so interesting. It is made of rick-rack and is an old screw-on earring. I want to get some rick-rack and try making some of these flowers. I know Martha has an article about this. I will have to dig through my mags. Too fun. 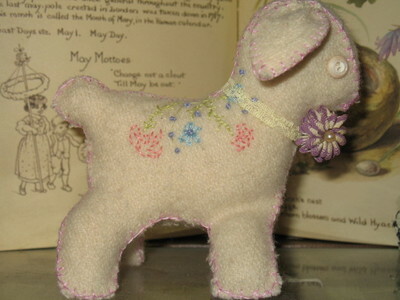 Here is the free (thank you Vicki) pattern to make your own lambkin. 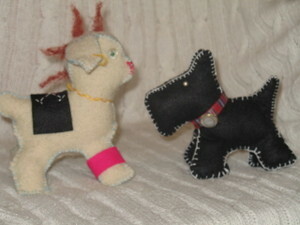 Make sure you check out the flicker group and see what other lambkins people made. They are all different. It is amazing to see how each person interrupts something. 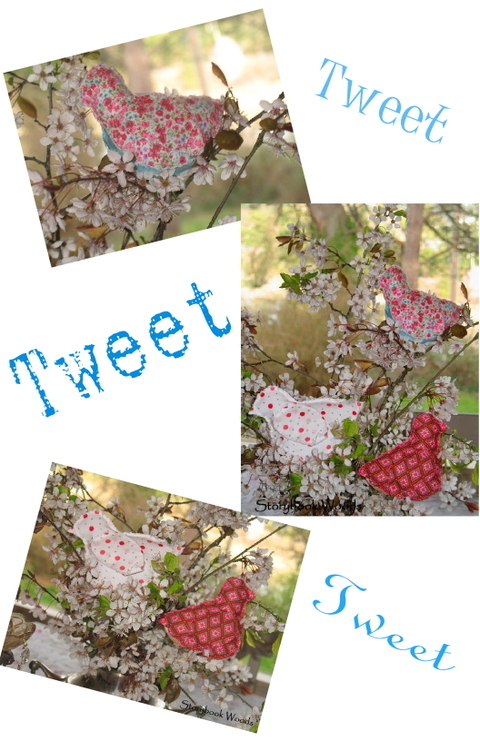 I have had several ladies ask me about the birds I have embroidered on the dishtowels I have given Chloe for Easter. I used a free Martha birdembroidery pattern. It is state birds. I have made several. And have used them as a guides for my birds. At first I did my birds true to life. But I was inspired by Turkey Feathers and am now playing with the colors. I have to say one "gadget" that has so helped me in my embroidery is washable wonder marker. It is amazing. You write on your fabric and then you add a little water and it disappears. I love it because if I have half embroidered a design and I want to change it, I just wet it and start all over again. It is not very expensive. I highly recommend one. Also Aubern'e has a light box I use to trace my designs. But Angie (thank you Angie) taught me a trick. You can tape your design on a window and put your fabric over that and use the window as a "light box". Let me know if you do any of the birds and how they turned out ! !